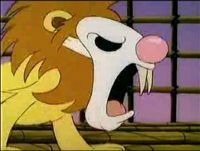 A Shyguy Lion is a lion that wears a Shyguy mask over its face. Despite being a species, only one was ever seen and was shown to have a bad temperament. It appears during The Super Mario Bros. Super Show! episode "Raiders of the Lost Mushroom". Kolonel von Koop, having apprehended Mario, Luigi, Princess Toadstool and Toad after retrieving the Lost Mushroom from the Temple of Koopa, locks them up in a tree hut, where he releases a Shyguy Lion on them. Mario uses Luigi's plumber's snake to tame the Shyguy Lion, causing it to mew like a kitten in fear. Mario then orders the Shyguy Lion to break out of the tree hut for them, allowing him and his friends to escape. After this, the Shyguy Lion is never seen again. This page was last edited on March 20, 2019, at 18:19.